We’re really excited to announce that the new addition to our range is Asparagus Dry Gin. A truly unique premium dry gin using Worcestershire asparagus as a main botanical. Numerous distillers in the past have attempted to incorporate asparagus into their gins, but with varied success. We have spent over six months experimenting with distilling processes and botanical blends, to understand the best way to unlock the vegetable’s flavour. And we’re thrilled with the result. Distilled using the one shot method in a traditional alembic copper still, the result is an incredibly smooth, distinctive dry gin. Through distillation the asparagus delivers an earthy, nutty-sweetness on the palate. Our blend of botanicals, enhanced by local brine salt that’s added during the distillation process, complements its characteristics wonderfully. Garnish your Hussingtree Asparagus G&T with a couple of fresh mint leaves. Perfect for springtime. 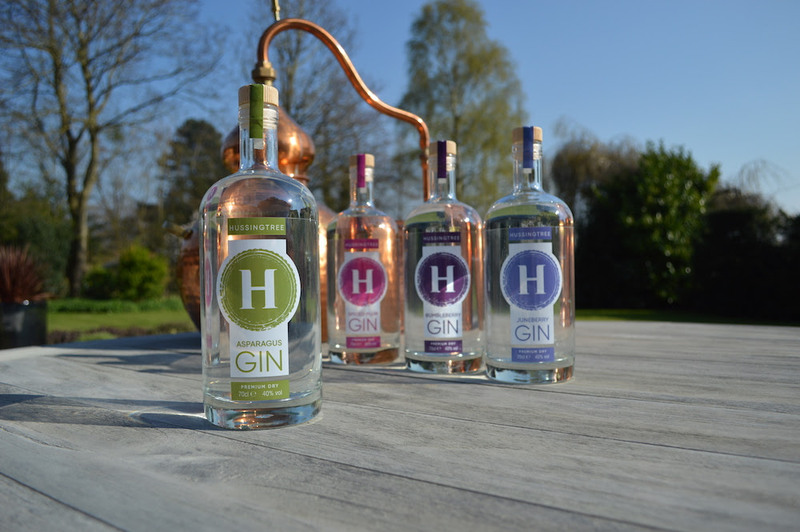 We’ll be launching our Asparagus Dry Gin to coincide with the British Asparagus Festival, which kicks off on 23rd April at The Fleece Inn, Bretforton. We’ll then be at a number of events during the subsequent weeks, including The Worcester Gin Festival and The Three Counties Spring Show. Visit the events page on our website by clicking here to find out more. A few new dates will be added shortly. Bottles of our Asparagus Gin will be on the shelves at a select number of bars, hotels, venues and retailers. And of course, you can purchase a bottle (available as both 350ml and 700ml) from our website when it’s available later in the month. We’ll drop you an email to let you know when it’s online for purchase. You may also notice in the pic above that our labels have evolved. These are being launched at the same time as our Asparagus Gin. The new labels provide greater stand out on shelf and improved differentiation between the variants in our growing gin range.